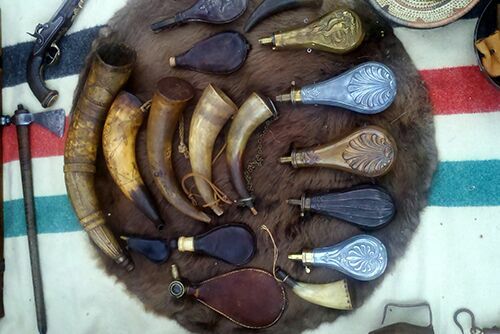 The Tools of a Mountain Man – Priming horns, a J. J. Henry pistol and more atop a beaver pelt and a Hudson Bay blanket. The Hudson Bay Company issued blankets to their fur traders who used them for trading with the various tribes. Most commonly they were white with colorful stripes. Red blankets were special gifts for the chiefs of the tribes. Fur traders would trade their blankets, cloth, knives, tomahawks, beads and bobbles for the pelts and then sell the pelts to the company when they returned east. Many of the items they needed were carried in their “possibles” bag. Learn more about the Hudson Bay blankets and more!